What to bring? A swim suit and towel. Can I wear spectacles? Well people have, but you need wipers... Contact lenses are fine. Do I need to be able to swim? We have had a number of non-swimmers and they've had a great time. However, we do not recommend high flow trips to non-swimmers and some trips are more suitable than others. If you have any concerns you should call us to discuss them. Will I be scared? Quite possibly. If you're worried about things talk to us before you come. We enjoy taking people who are prepared to push themselves. Remember, the more you put in, the more you get out. Attitude is all.. I'm a vegetarian? Our lunches contain no animals. Let us know if you have specific requirements. Is it cold? It can be, especially at the start and conclusion of the season. On chilly days we pull out our range of 'accessories' - hoods, gloves etc all in tasteful rubber and it works a treat. Am I too old? Probably not, attitude is all. Current age record is 76 years. When can I go? We start running trips in early Oct and run every day except Christmas Day (25th Dec) and New Years Day (1st Jan). We continue until early April each summer season. Am I too young? We have taken children as young as 11 years on our easier trips dependent on conditions, the childs' experience and support. We suggest Dec - Feb as these are the warmer months. Contact us directly for specific information. Minimum age for Niger Stream is 12 years, Big Nige 14 years, Wai Rata and the Leaping Burn 16 years. What footwear? We supply all footwear. Can I bring a GoPro/Other Camera? You are welcome to bring your own camera (at your own risk), it will need to be waterproof and it should have an attachment. We have helmets with the GoPro mount that you are more than welcomed to use. Make sure that you bring additional attachments just in case the helmet is not a good fit for your head. Also, be sure to be familiar with your camera - the canyon is not a suitable environment to learn how to use your device. Which trip should I do? Contact us directly and we will help you choose. 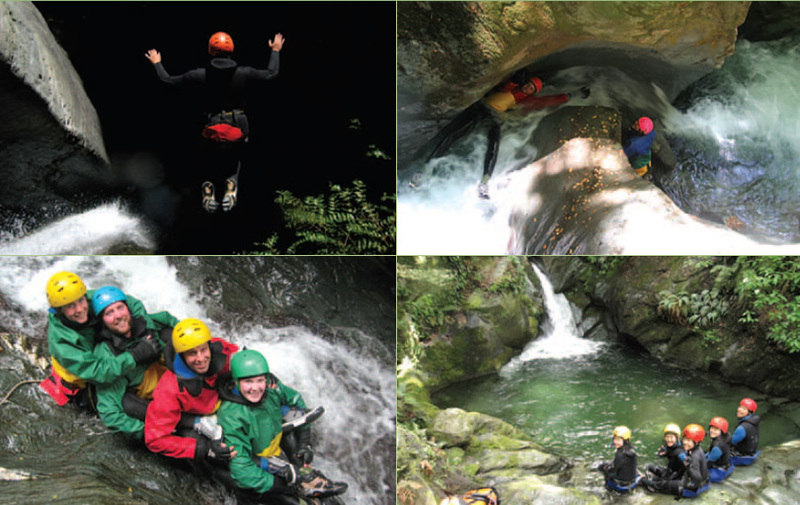 Niger Stream, Cross Creek and Robinson Creek are most suited for beginners, Big Nige and Wai Rata are intermediate and the Leaping Burn and Wilson Creek are advanced.